Yesterday was a day to go down to The Clink to do some more baking with the staff there. For those of you who don't know, The Clink is an excellent restaurant in High Down prison, staffed almost entirely with prisoners who are training and getting qualifications to become cooks, cleaners, and front of house staff while in prison. The food is excellent (and not excellent for a prison!) and I have the honour to be helping them with their bread menu, baking only sourdough bread because they are not allowed to have yeast in a prison. Further, because Al, the head chef and founder of The Clink is Italian, I have taken on the Italian Bread Project - adjusting all of the recipes in The Italian Baker by Carol Field from yeast recipes to sourdough recipes. Baking at The Clink is in just plain fun and often hilarious. It is a crowded, restaurant kitchen and when the lunch trade begins to speed up around 11.30 the calm atmosphere and open counter spaces vanish. Noise and movement increase and space decreases. Rising bread (sourdough takes a while) is shifted from the serving counter to anywhere it can find a place to be. Under tables, on top of the ice cream maker, next to the grill (it was a bit hot there)...and I find myself as the only person with nothing to do as I am simply waiting for the dough to be oven ready. Except yesterday when I got to knead and roll out rotis - ready for the lunch time curry order. An Asian member of staff was co-opted from his normal job front of house to make the rotis. Why? He was Indian - He MUST be able to make rotis! It's in his blood, no?! I was co-opted into roll out the rotis (although not exactly, given I am there to do bread) because he felt that women have a better touch with rotis. So I rolled and he fried. What a team! As there was no wire roti implement such as I saw at the Delhi Grill we had to dry fry them directly on the enamel hob. I am certain his mother's rotis are better, but these were pretty good nonetheless. With saltless tuscan bread, a plain levain, a rye and whole wheat sourdough with poppy seeds, honey and olive oil, and a couple of 100% ryes thrown, in we were in a baking frenzy yesterday but the triumphant moment was clearly the sourdough hot cross buns. Mix 1 cup of the 1857 sourdough* with 1 cup of white wheat flour and 1 cup of water. Mix. Cover. Leave 12 hours. Mix 3/4 cup of the refreshed 1857 sourdough with 1 cup of milk and 2 cups of white wheat flour. Mix. Cover. Leave 12 hours. Soak a handful of dried fruit in some warm water. 1. Drain the fruit, reserving the soaking liquid. 2. Beat 2 oz butter, 3-6 big spoons of sugar, and 1 egg. Add the refreshed 1857 sourdough and continue to beat until it is well incorporated. 3. Sift 1.5 cups of white or whole wheat flour with 1 tsp cinammon, 1 tsp ginger, 1 tsp ground allspice, 1/2 tsp clove and 1 tsp salt. Add this to the mix and knead well for 10 minutes. Let it rest in the bowl for 10 minutes. Drain the fruit, reserving the liquid, and incorporate the fruit into the dough with your hands. Don't worry about the dough - it will recover. Just don't squish the fruit or you get brown smeary bits in the dough! You may want to take it out of the bowl to do this and then pop the dough back in the bowl. 4. Let it rest for 60 minutes. 5. Take the dough out and divide into pieces about 75 g each. Roll them into a tight ball and place on a baking tray that is lined with baking parchment. Cover with clingfilm or a damp towel and let rest 60 minutes. Preheat the oven to 200 degrees. Stir until there are no lumps and then pipe a cross on every bun. Bake for 18-20 minutes. The buns should sound hollow when tapped. The bun should be brown and the cross should be light. While they are baking, boil the liquid in which they were soaking until it is a thick syrup. Paint this on the buns while they are still hot - just out of the oven. *This is my wheat sourdough starter that has been alive since 1857. It is a 100% hydration starter (by volume) so has the consistency of thick cream. At any point in the recipe you can use whole wheat or substitute clarified unsalted butter or the fat of your choice for the vegetable fat. It will make a slightly heavier bun but tasty nonetheless! I have tried these and they are absolutely delicious! 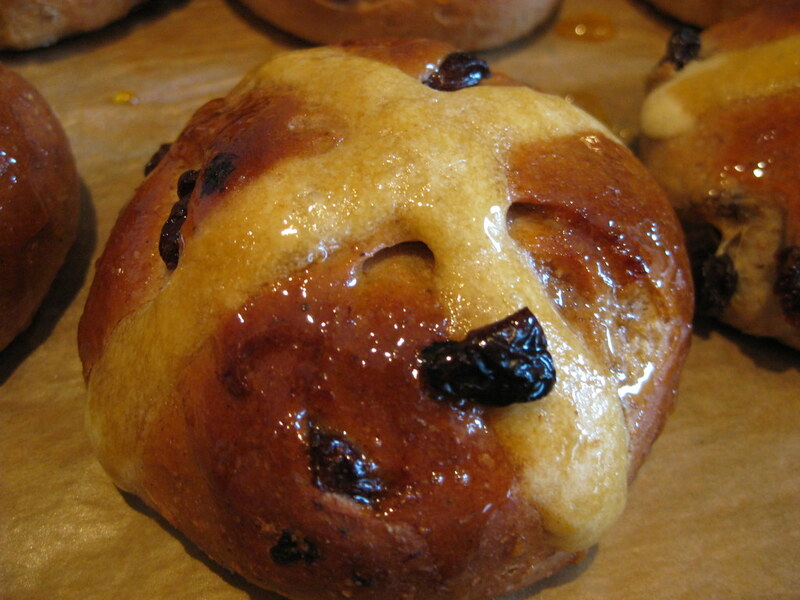 Better than the 'standard' hot cross buns by far....will definitely be making these in a few weeks. These look fabulous! I am going to make these this week. I'm wondering if the crumb on these is soft and light or a bit dense? I know sourdough purists would never add yeast...but, I have tried a few recipes with adding a little yeast and it really lightens up a possibly heavier loaf. If these are a bit heavy, do you think adding a little yeast would help or ruin your already-wonderful recipe? Thanks so much! Hi there, SORRY for late response - have been a bit busy - in the bakery!!!! Of course you can add yeast if you like. That way you will have the flavour of the sourdough and the lightness of a yeasted bread. Sourdough is always a little denser and chewier than bread made with yeast! Hi there, sorry to be confusing. I always operate on the basis that you make more sourdough than you need so that you never run out. So, when you refresh the starter, use 3/4 cup to go to the next step and put the rest back in the fridge for another day! It goes to sleep in the fridge as long as it's in an air tight container! Just made these - fabulous!! Light and well risen. Very tasty! Scoffed 2 straight from oven!! Fantastic! That is what we love to hear. Thank you for writing! Can I do all the steps the day before I want to bake them. That way on Easter morning I can just throw them in the oven? Just wanted to say how fab this recipe is. I made them this afternoon and they turned out fantastic! ooo brilliant! thank you for letting us know. Just making these now, but wondering if there shouldn't be some salt added with the spices ....? good lord! yes! 1 tsp probably. thank you for telling me! Hi, I am very eager to make these buns, and have a question about the starter hydration. I don't fully understand hydration as a baking concept and maths is not a strong point so I have to follow recipes to the letter without variation so-as to avoid the need to think for myself...! You said that your starter is 50% hydration. I think my starter is 100% hydration... every time I feed it I keep 40g of starter and add 40g flour and 40g water (would obviously need to build this up to even reach one cup of starter required for the recipe!). So I'm just wondering how this different hydration in my starter will impact my success with these buns? Should I reduce water in the first step to allow for it? Sorry if this is an incredibly dumb question! Thank you. Dear Bec, this is NOT a dumb question especially because the mistake is mine. I have since fixed it. of course mine is a 100% hydration starter too so carry on! Sorry this recipe is in cups and spoons and not in grams. Most of my recipes are in grams but this was an oldie and a goodie and it originated in cups and spoons! Thank you so much! Cups and spoon measurements are no problem! Once the mix is made wigh milk, should it sit for 12 jours at room temp or in the fridge? Hi Babette, it can stay at room temperature.